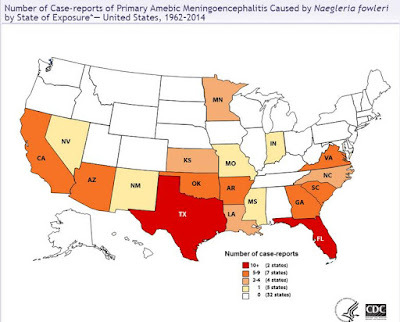 Although extremely rare, nearly every summer we hear of a handful of cases of PAM (Primary Amebic Meningoencephalitis), caused by an amoebic parasite called Naegleria Fowleri. Between 1962 and 2014 there were 133 cases of Naegleria Fowleri infection reported in the United States, with all but 3 of them fatal. 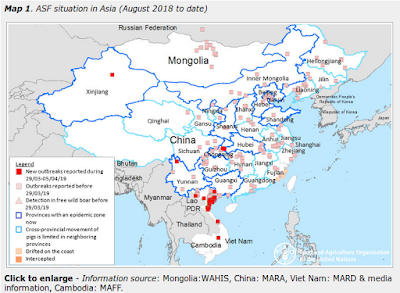 Until a few years ago, nearly all of the Naegleria infections reported in the United States were linked to swimming in warm, stagnant freshwater ponds and lakes (see Naegleria Fowleri: Rare, Deadly & Avoidable). In 2011, however, we saw two cases reported in Neti pot users from Louisiana, prompting the Louisiana Health Department to recommend that people `use distilled, sterile or previously boiled water to make up the irrigation solution’ (see Neti Pots & Naegleria Fowleri) and a 4 year-old infected in 2013, through contact with the municipal water supply. Although mostly seen in the southern states (see map above), infections have occurred as far north as Minnesota. While not a hotbed of activity, last summer we saw a case in California (see CBS News Central California Woman, 21, Dies From Brain-Eating Amoeba) involving a 21 year old woman. At the time, few details were available on how she came to be infected. Today the CDC's MMWR carries a Notes from the Field report on the epidemiological investigation, which suggests a poorly chlorinated spring-fed swimming pool was the likely source of infection. This is an unusual finding, and furthers the recent pattern of seeing PAM cases arise from atypical settings (Northern states, via neti pots and municipal water supplies, etc.) in the United States. I've only posted some brief excerpts, so follow the link to read it in its entirety. When you return, I'll have a bit more. On June 17, 2015, a previously healthy woman aged 21 years went to an emergency department after onset of headache, nausea, and vomiting during the preceding 24 hours. Upon evaluation, she was vomiting profusely and had photophobia and nuchal rigidity. Analysis of cerebrospinal fluid was consistent with meningitis. * She was empirically treated for bacterial and viral meningoencephalitis. Her condition continued to decline, and she was transferred to a higher level of care in another facility on June 19, but died shortly thereafter. Cultures of cerebrospinal fluid and multiple blood specimens were negative, and tests for West Nile, herpes simplex, and influenza viruses were negative. No organisms were seen in the cerebrospinal fluid; however, real-time polymerase chain reaction testing by CDC was positive for Naegleria fowleri, a free-living thermophilic ameba found in warm freshwater that causes primary amebic meningoencephalitis, an almost universally fatal infection. This represents the first time this type of exposure to N. fowleri has been reported in the United States and continues to highlight the changing epidemiology and expanding geography of this pathogen (1,2). In Australia, several cases in the 1960s and 1970s related to nasal exposure with untreated drinking water piped for hundreds of miles overland were reported (3). This case highlights the importance of operating and maintaining properly treated swimming pools (http://www.cdc.gov/healthywater/swimming/protection/pool-user-tips-factsheet.html) and the role of water distribution systems as potential environments for the proliferation of N. fowleri. Clinicians: For 24/7 diagnostic assistance, specimen collection guidance, shipping instructions, and treatment recommendations, please contact the CDC Emergency Operations Center at 770-488-7100. Clinicians: CDC now has an investigational drug called miltefosine available for treatment of free-living ameba (FLA) infections caused by Naegleria fowleri, Balamuthia mandrillaris, and Acanthamoeba species. If you have a patient with suspected FLA infection, please contact the CDC Emergency Operations Center at 770-488-7100 to consult with a CDC expert regarding the use of this drug. Avoiding water-related activities in bodies of warm freshwater, hot springs, and thermally-polluted water such as water around power plants. Avoiding water-related activities in warm freshwater during periods of high water temperature and low water levels. Holding the nose shut or using nose clips when taking part in water-related activities in bodies of warm freshwater such as lakes, rivers, or hot springs. Avoiding digging or stirring up sediment while taking part in water-related activities in shallow, warm freshwater areas. Recreational water users should assume that there is always a low-level of risk associated with entering all warm fresh water in southern tier states. Because the location and number of ameba in the water can vary a lot over time, posting signs is unlikely to be an effective way to prevent infections. In addition, posting signs on only some fresh water bodies might create a misconception that bodies of water that are not posted are Naegleria-free.